Happy 10th Anniversary, U3A Todmorden! On Thursday, May 17th, U3A Todmorden met to celebrate the 10th anniversary of its first members’ monthly meeting. We were honoured by the attendance of Cllr Christine Potter, Mayor of Todmorden, and her consort, and representatives from our U3A cluster groups of Burnley, Clitheroe and Longridge. Many original members were there, including member 001, Geoff Boswell, erstwhile convenor of the Science and Photography groups, and former Science Advisor for U3A itself. Our afternoon was a varied one. We enjoyed an excellent quiz organised by Myrna Beet and Denise Wilson, based on our recollections of the last ten years. Our ‘Senior Moments’ Concert Party (oldest member over 90) gave us a taste of the performances they give in care homes. Their repertoire is heavy on nostalgia, as this goes down well with dementia sufferers. A survey was handed out to gather data on what U3A means to its Todmorden members, and the Creative Writing group read some of their work inspired by the idea of our 10th anniversary. Their stories and poems showed how getting older is much more bearable when you laugh, when U3A is easily confused with urethra, and when a family member’s ashes can end up as accidental rose fertiliser. But the focal point of the afternoon was Keith Coates’ presentation of the publication ‘U3A Todmorden – the First Ten Years – 2008-2018’, compiled by himself with a resilient team. This glossy publication is packed with our history, embracing our demography, ethnicity, socio-economics, education, membership, organisation, monthly talks, interest groups and the composition of the committee over the years. Keith’s talk was delivered with his characteristic mixture of seriousness and genial humour. Respects were paid to John McNair, our first chairman and moving spirit behind the founding of this educational organisation. Keith observed how John had raised an eyebrow at the idea of a lunch club. John would be pleased to know, therefore, that though we have retained a social element to our activities, he would find it hard to quibble with an organisation that promotes the learning of Anglo-Saxon and Greek, studies the novel, Shakespeare, opera and poetry, embraces science and computing, and stretches the brain with philosophy and world affairs. Keith observed that it was a curious fact that only 32% of our membership is male. It is of interest too that our membership is increasingly widely spread, embracing folk from Burnley, Rossendale, Littleborough and, remarkably, one person from Wigan. Equally peculiar is the fact that there are 54 members who pay but are involved in no group activities at all! Keith highlighted some of our work: the art exhibitions, the annual photography display in the Information Centre and the publication of ‘On the Write Lines’ by the Creative Writing group. He also remembered fondly a Christmas talk given by Gail Allaby, ‘Queen of the Undersea World’, dressed in full diving gear. Finally, Cllr Potter was presented with a copy of the booklet, and Ernie Rogan, our Chairman, drew this very happy afternoon to an end by announcing that copies were available free to members on leaving, courtesy of a generous grant from Todmorden town council. 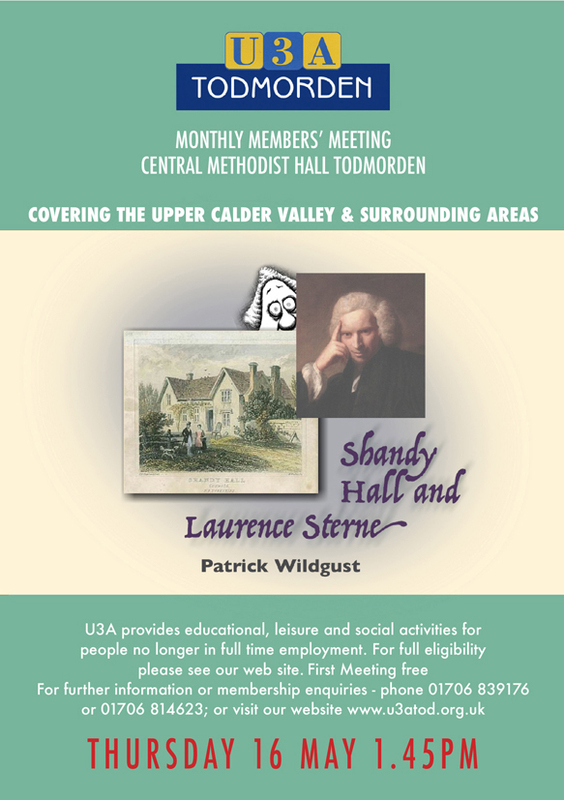 U3A Todmorden’s next meeting will be on Thursday, June 21st, 2018 in the Central Methodist Church Hall in Todmorden. The speaker will be Allan Shalks who will be talking about his interesting life in TV, theatre, radio and films. Our contact details are www.u3atod.org.uk (website), enquiries@u3atod.org.uk (email), or 01706 812015 (phone).